The latest issue of Edge Magazine (don't sue! don't sue!) features an interview with James Ohlem, Bioware's director for The Old Republic. In it he reveals another class: Smuggler (pictured), which will likely be announced next week. 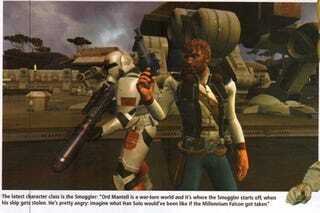 Says Ohlem: "Ord Mantell is a war-torn world and it's where the Smuggler starts off, when his ship gets stolen. He's pretty angry; imagine what Han Solo would've been like if the Millennium Falcon got taken."